You do not necessarily need to spend money discovering your family history. In this post I will show you 4 ways that you can conduct a free ancestry search online. Interested? Well then please read on! 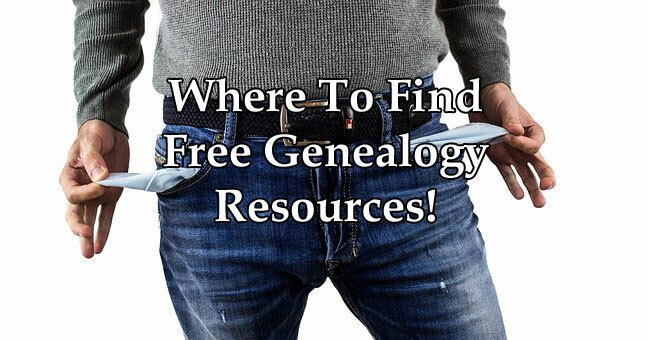 I have previously discussed 10 Free Genealogy Sites that can help you with your genealogy research. I wanted to add to this list with 4 more options that will prove vital for you on your family history journey. 4 Ways To Search Online! You might be surprised to learn that you can actually access records for free at the world’s largest genealogy search website. I am obviously talking about Ancestry who have become very popular for people who are tracing their family tree. But what records are for free and how can you can access them? Ancestry has a collection of more than 8 billion records stored within their databases. And believe it or not you can check them out for free. Although there are certain conditions that will limit your access to them. My 4 Ways You Can Get Records at Ancestry For Free post shows you a number of options that are available to you. In this post though I will just briefly mention these options. Most of the records that you will find on Ancestry you need to pay to access. But there are nearly 2,000 records that can be of useful for your family history research. These include the 1880 and 1940 US census records, and the 1881 and 1911 UK census records, plus many, many more records. When you sign up to Ancestry you can take advantage of the 14-day free trial. This is a way for you to see whether Ancestry will be helpful with your research and to get accustomed to the Ancestry website. Once your trial has lapsed you will automatically be signed up to what package you selected when you signed up. There are times during the year when Ancestry will allow you to access their databases for free. These occasions occur during numerous different holidays, so you will need to keep checking the site for when these happen. My method for building up my family tree quickly was to check out my local library. From there I was able to access a few of the major genealogy sites, including Ancestry. Libraries often provide genealogy records for free, so why not check out what you local library has to offer. The Digital Public Library of America (DPLA) allows you to find discover your family tree for free by linking to repositories from all over the United States. From this portal you can actually view images of documents containing your ancestors. The DPLA website links to hundreds of archives, libraries, museums and many different institutions across the US. There are also records from a number of foreign countries as well. Each of these repositories will contain a different selection of online records that will be of use to you. This portal that the DPLA provide not only make it easy for you to search these many different sources of information but also makes it easy for you to search for your ancestor all in the same place. From the main page of this site I entered a search for “couch family genealogy” and it came up with a number of different sources for me to check out. Finding records maybe hit and miss! The results of this particular search maybe a bit hit and miss but it is definitely worth checking out. You just don’t know what you will find when you first start to search for your ancestors, and a site such as this can throw up some interesting finds. It doesn’t hurt to start this way, just to see what you will find. After that you can add terms such as birth, death, marriage, census, pedigree, family, and so on. There are also filters that you can use that will limit your search results. These include contributing institution location, subject, language and date. You may want to refrain from using the date filter as i has been known to incorrectly omit results that might actually help you. Other tips to search for your ancestors on the DPLA site! If you cannot find a particular ancestor then why not try different spellings of their name. I have tried this tip and it has worked for me on a number of occasions. I once found an ancestor of mine that was transcribed as “Cauch“. So, this tip does work! Also, you may want to add quotation marks to help you with exact matches, such as “John Couch“. And use the minus sign to remove a term, such as “-texas“. FindMyPast is another major genealogical website where you can actually access records for free. Although not as large or as popular as Ancestry you can certainly learn a lot about your ancestors from FindMyPast. Alongside Ancestry, FindMyPast was one of the first genealogy search sites that I checked out when I began to explore my family history. They have helped me immensely trace out my family tree and gain valuable insights into the lives of my ancestors. There are ways that you can access records at this website for free, similar to Ancestor. These are shown in my 4 Ways You Can Get Records at FindMyPast For Free post. I will though highlight these methods here in this post for you. The 1790 to 1940 US census records as well as Birth, Marriage and Death records for the US and Canada are all free to access. And also you can check out Irish Catholic Parish Registers for free. A 14-day free trial is also offered to see what you can do at FindMyPast and to try out the user experience. It’s another great way to get valuable information about your ancestors. Free access to records is also granted at FindMyPast but for an even shorter period than the trial. Despite that you can really take advantage of these events, if however you know when they are. And similar to Ancestry I was able to check out what FindMyPast had to offer by visiting my local library. If Ancestry failed me then I would refer to FindMyPast to see whether I could find what I was looking for there. And it certainly did help me. One resource that has been brought to my attention thanks to a reader of this website is FreeAncestrySearch.org. From this site you can get contact details of various United States government offices and societies as well that can help you with your genealogy research. I will point out here now that these US offices MAYBE able to help you with your family tree queries and provide you with free public records. Genealogy is a hobby where there maybe numerous dead ends, (no pun intended), that you will come across. If you are after free records then this resource is certainly worth considering. And that is why I have added it to this list of free ancestry search ways for you to consider. The FreeAncestrySearch website is broken down into 7 different categories to help you find the government building. These categories are then broken down into US state and county as I will discuss further. Cemetery – Find burials, funerals, graveyards, gravesites, tombstone and headstone locations. Clerk – Find marriage licenses as well as divorce filings, criminal, jail and arrest records. Court – Find legal proceedings, cases, filings, documents and appeals. Historical Society – Societies can help you to discover the local history and culture of the area in which your ancestors lived within. Library – Find vital, genealogy, historical and property records. Marriage License Office – Find marriage and wedding licenses, certificates and proof of marriage. Town & City Hall – Find vital records, birth and death certificates, marriage licenses, and also property ownership records. After selecting a category you are then asked which US state and county you would like to search for. will then be presented with the address and contact details of the government building that will help you further with your research. In my opinion this is a very useful site that can help you with your genealogy research. There is nothing more frustrating than when you do not know which way to turn next. So, knowing where to turn and getting professional help is very much welcome. There are no genealogical records stored on this website and it does not act like a link between sites. Because of that you will not find actual documents on this site. Despite these apparent drawbacks I still found that it can offer you a lot of help tracking down free public records that will help finding your ancestors. If you are interested in discovering your family history I recommend that you try to find out as much as you can for free first. Well, you do not want to be spending money on documents, certificates, records or anything else that you could have obtained for free. That money could have been better spent on items that you will need to pay for. All of these resources that I have listed and discussed in this post will help you immensely. And as I have mentioned in this post both Ancestry and FindMyPast helped me build my family tree extensively. So, give at least one of these ways a go. If you decide to check out these free genealogy sites then please come back and let me know what you think. I would love to hear from you. I hope you enjoyed this post showing you 4 ways how you can conduct a free ancestry search online. If you have any questions or comments then please leave a comment below. 4 Ways You Can Get Records at Ancestry For Free! Hi, I love your site. I have been doing genealogy for years and make use of a lot of these sites, forgotten about a few a found a few more to use. thank you so much. I am doing a dead end research into Native Americans in Washington State in the 1820-1870 range with no results. The family was one of the first settlers in that area and helped to make the counties. I do not know the tribe, but know the individual was in Washington in at least 1860 to 1869 and had children, but back then they didn’t keep records at the state level and I am not finding anything elsewhere. It is hard enough to find out a maternal, but she is also Native American. I was hoping with a unusual name (Lox) it would be easier, but it is not. would you happen to have any ideas on a good place to begin. I have a rough years she was alive, and where she ended up. I didn’t see you mention interment.net it is a free site from what I have used and does world, US and obituary stuff. just thought i would let you know. i didn’t see it, but I haven’t gotten through your whole site yet, which I will. thank you so much for this great site. I am glad that you love the site. It’s been a labor of love so I am glad that it pleases you. I haven’t really explored Native American ancestry just yet on this site. As you can imagine genealogy is a vast subject. I have reviewed though the Native American Genealogy Premium Collection which contains many resources that can help you. I’ll have to explore this area further. Thanks for pushing me in that direction. I haven’t yet explored Interment.net as well so will have to look into that as well. All the best with your genealogy research Lynda. There is plenty of guides, tips and helpful reviews on this site so I hope that you find more useful information elsewhere on this site. I have tried before to chase down my heritage as I was informed my family owned a Castle in Ireland with literally 1 million acres in the early times of the 17th century. But, I was never able to follow into it without paying someone for it. I can Google history on the castle now but not the details I desire. The castle is called Fogarty Castle. Easily found but not so easily verified as you know. Your post here now has reignited my desire to search out the details now that you have showed me ways to look further for free. I have not tried yet but I will today because of you and this post. Thank you for this. I have wanted to find out more about “MY” Castle! That’s pretty impressive and interesting that you have a castle or rather once had a castle. I checked out the website for it at Fogarty Family History. You may want to get in contact with the owner of the site, if you haven’t already. I wish you the best with finding out more about your castle. Thank you so much for these valuable sources. I had no idea that there were free ones available online. I particularly like the options available for me at both Ancestry and FindMyPast. Thank you again. You’re very welcome. I too was surprised that you could actually get records at both of these sites for free. But I am glad that I could as it really helped me build quite an impressive tree. What a great article Owain and filled with great information. I’ve always wanted to learn about my family tree but always thought it was something I would have to pay for. Good to know I can do it for free and because of your article I have plenty of options to do it. Thank you Juan. There are plenty of resources out there that are free. Asking your relatives for help is another great way that you can build your family tree. There will come a time though when you will need to pay for your genealogy, such as genealogy software program and you maybe interested in a DNA kit. Thank you for providing this information. There are a lot of different websites out there so it is good to have the recommendations. It is also nice to know that there are some different free times where I could get a free glimpse of what the website has to offer. My pleasure Marsha. There is plenty out there, both online and offline. It’s just knowing where to look and how to look for it. I am glad that this post was helpful to you. I have always been interested in tracing back my family tree, my parents never could give me enough information for my liking and I love history! Thanks for these resources Owain, I’m searching on Free Ancestry Search right now! I recently found out that my family was once a baronetcy in England a few generations ago but sadly the family mansion and estate has been turned into private school! Glad to be of service Harry and glad to see that you’re already starting to look at these resources. That’s interesting about your English heritage. Too bad that the mansion and estate has been turned into a school, rather than staying in the family. But at least it is still being used. It could have been left vacant and then fallen to ruin.